Self storage is slowly being recognised and utilised as a place to do business, far beyond the typical remit of storing items and documents. There have been many success stories in the press of individuals using self storage as stock rooms for online ordering, to more ambitious projects such as gymnasiums, and even being a location for the creative arts such as painting and music. It is worth considering how this is permissible, when self storage is usually understood to be a place to just store a few things. 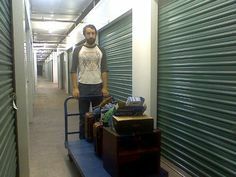 In principle, self storage is business space, no matter the size of the unit. As businesses must do, the self storage company would at some stage have agreed the general legal purpose of the premises and what band of activity it falls under with the authorities. So technically speaking, you could carry out activities on the premises that do not constitute self storage, but are under the agreed definition of usage of the building. Knowing, for example, that many customers crave small office spaces, this is setting many storage companies to the task of expanding their services to include small scale serviced offices, since running an office from the premises is obviously legitimate activity – the facility after all is going to have an administrative area of its own lurking somewhere in the building. If you have a great idea that you want to try out on self storage premises, it is worth speaking to a few self storage companies near you to identify if the idea is permissible under local rules, and also if the storage company has set boundaries on the sort of activity that they are happy for their customers to engage in whilst under its roof. Some may be more open to ideas than others, but hopefully an agreement can be settled about where the lines can be drawn. Activities that generate a lot of noise or mess, take too much advantage of the generosity of the facility’s power and amenities, or use hazardous materials are likely to be nipped in the bud before they’ve even started. But it is reasonably fair to say that if your activity is quietly productive and does not involve disturbance to other users of the facility or you bringing an excess of people running amok into the building, then you ought to be within guidelines for company policy, health & safety and general respect for others. Essentially, if the rest of the facility can run without knowing its there, in terms of disturbance and risk, your idea could well be considered viable. « Are You Sure About What You Are Storing?